IEC Standard 60364 specifies a Two Letter Codes to identify type of earthing. 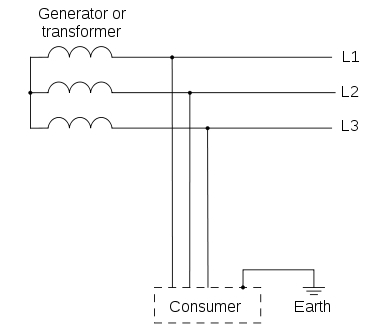 It also defines three families of Earthing arrangements. 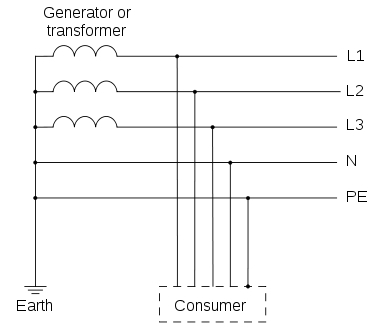 The two letter code is based on Source Side – Device Side Earthing. 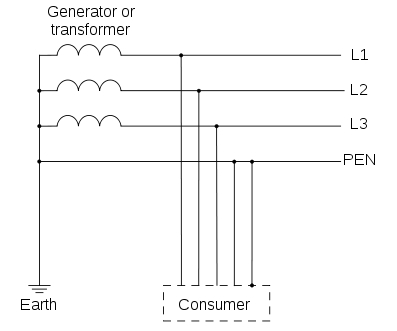 The First Letter indicates how the Earthing is done on Source side (Generator / Transformer). The Second Letter indicates how the Earthing is done on Device side (place where electricity is consumed at customer premises). PE – Acronym for “Protective Earth” – is the conductor that connects the exposed metallic parts of the consumer’s electrical installation to the ground. N –Also called Neutral. It is the conductor that connects Star point in a 3 phase system to the earth. TN-S: In this, separate conductors for Protective Earth (PE) and Neutral run from Consumer’s electrical installation till the source. They are connected together only at the power source. 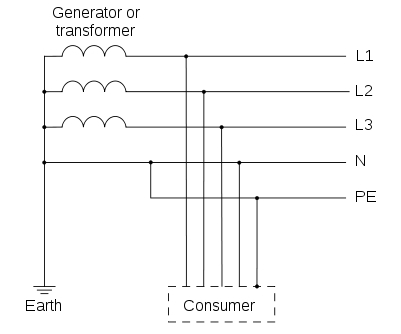 TN-C: In this, there is a combined conductor called PEN (Protective Earth-Neutral) which is connected to earth at the source. TN-C-S: In this type of earthing, part of the system uses a combined PEN conductor for earthing, whereas for remaining part of the system uses separate conductor for PE and N.
Usually, the combined PEN conductor is used near the source of the system. 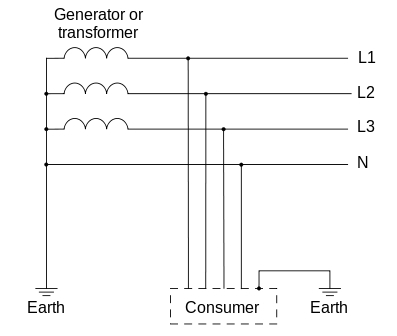 In TT type of earthing system, consumer employs its own local earth connection in the premises, which is independent of any earth connection at source side. This type of earthing is preferred in telecommunication applications, because this system is free of any high or low frequency noise that comes through neutral wire connected to the equipment. 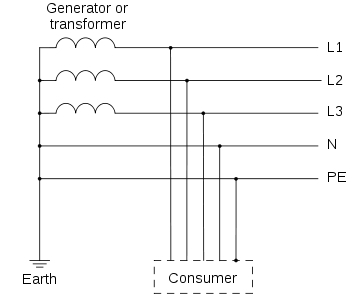 In IT type of earthing system, there is either no connection to earth at all, or it is done via a high impendence earthing connection. or copy this trackback: http://engineering.electrical-equipment.org/iec-standard/types-of-earthing-as-per-iec-standards.html/trackback from your own site. Very nice post you got there! Thank you! Can anybody assist me how to get more than 1K ohms betweens 2 earth pits ? My project is IT distribution system, and I am using step down transformer for 230v power loads, my question is , is it necessary to ground the secondary X2? If yes, why we should ground it and what is that system called ( TN or TT). And is it necessary to use PE conductor cable for external load , such as anti condensation heater, single phase fan, etc). Just join this group. Anyway..from my outstanding, earthing system shall be followed the Country Earthing Standard so no doubt on combination of system…. What is name of this application? Do we need an external grounding cable which connects outside walls of DB and deck floor or any flooring around. Modern DB have got a bit different internal system ! There is need to test the nature and type of soil before connecting the neutral to the ground. Dear Tom, could you tell how many ohms the Code requires and what conditions related to this requirements? what is the system normally used in Saudi Arabia? what is the system used in KSA? I just really want to clarify if the earth for source and device and other metlic and other electrical source, can be combined with the earth lead for the LPS. I have doubts in it since I didn’t have any known installations from my experiences from the middle east to the south east. ie: Material Copper or GI : Conductor size ,75 X 6mm or 50 X 5mm. Especially For the Neutral of a Transformer in a Residential Gated Colony. Do hope I receiver a reply to my queries. In my above message I did not have a Website after sending it a Website was created.